The original NGPC flashcart is back with a much needed upgrade offering a solution to sky-high Ebay prices. However its limited capacity is beginning to creak a little in the face of competition. I want to preface this hardware review with a simple token of thanks to hobbyists and retro gaming enthusiasts everywhere. In a world of biverted Gameboys, handheld N64's, Dreamcast homebrew and fan-translated JRPG's there are so many people out there tinkering away to keep our obsolete interests alive in the year 2017 that it really does demonstrate the strength of the community we have built over the decades. Therefore, I want to pre-empt any criticism I may offer in this review by making it absolutely clear that it is not intended as disrespect to one such pillar of the community or the personal projects that he has chosen to make available to people like myself, who wouldn't be able to knock something like this together in my wildest dreams. Anyway, let's start with a bit of history. The original Flash Masta came out in 2011. Essentially it was a flash cart for the Neo geo Pocket system that worked in unison with a reader/writer device called the Link Masta. This could be hooked up to a PC and be used to either flash Roms to the cart or dump and transfer data from existing NGPC carts. Together they retailed for the not inconsiderable sum of $150 but were the only real solution for playing Roms or homebrew on real hardware. 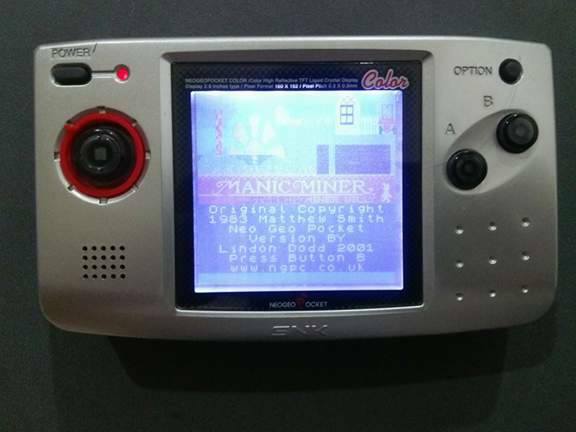 Various upgrades have followed throughout the years, as the cost of NGPC titles has steadily risen, bizarrely sky rocketing to insane levels in the past 3-4 years (Seriously, Magical Drop Pocket just sold for £320 on one auction - it's utter madness that seems to hold to no consistent pattern as of late). 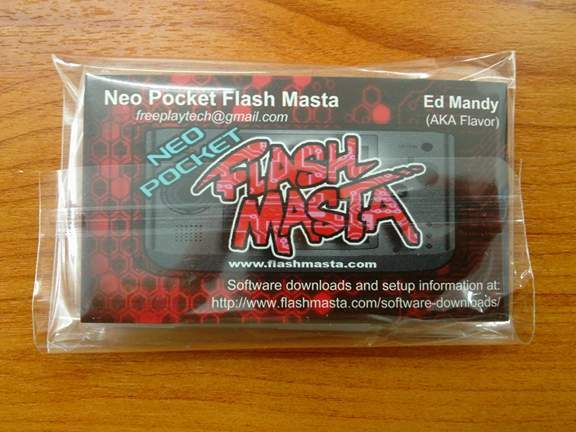 The current revision of the Flash Masta brings it bang up to date for those of us who simply want to use it to play games. It no longer needs to be hooked up to the Link Masta tech and now comes with a USB connector in the side of the cartridge itself, meaning that it can be plugged directly into a PC allowing Roms to be flashed to it in an instant. ​Last week one finally wound its way to Obsolete Island and what follows are our initial impressions. 10/10 for the creative description that brought about a chuckle...but I'm slightly less certain it needed to arrive in such a giant box. 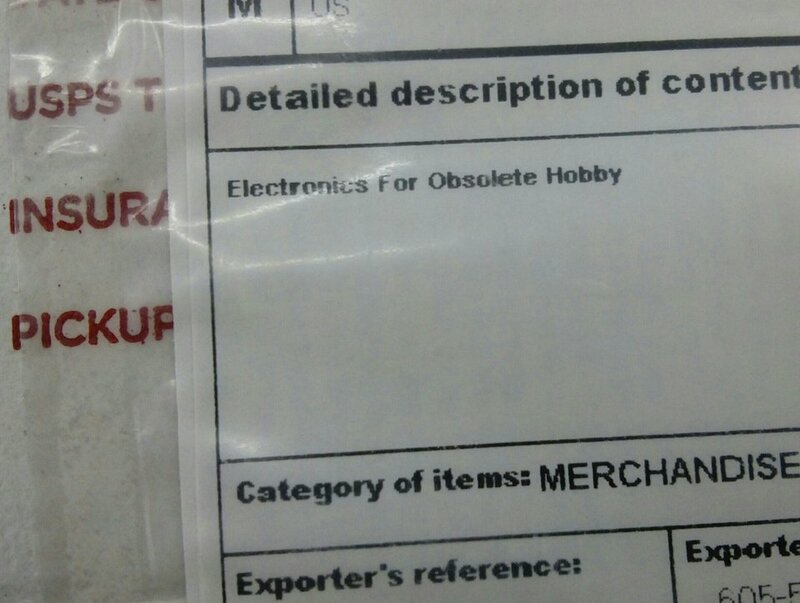 The most off-putting thing about ordering the product came when checking out. The Flashmasta itself retails for $59.99 if, as we did, you choose to have it installed in a pre-cut shell (other options being sacrificing a legit cart or just getting the bare circuit board). This seems a reasonable cost (although slightly more expensive than other options - of which more later) however the shipping on top of that seems excessive to say the least. The cheapest option is a relatively okay $13.99 but with limited tracking and no insurance and a warning on the website that this is at your own risk, this might be a risky investment for some. The next best option (and seemingly the only sensible one for international buyers) is a whopping $36.99, over half the price of the actual product! (the box presumably cost $6.99 since the actual postage stated on the box was only $30). 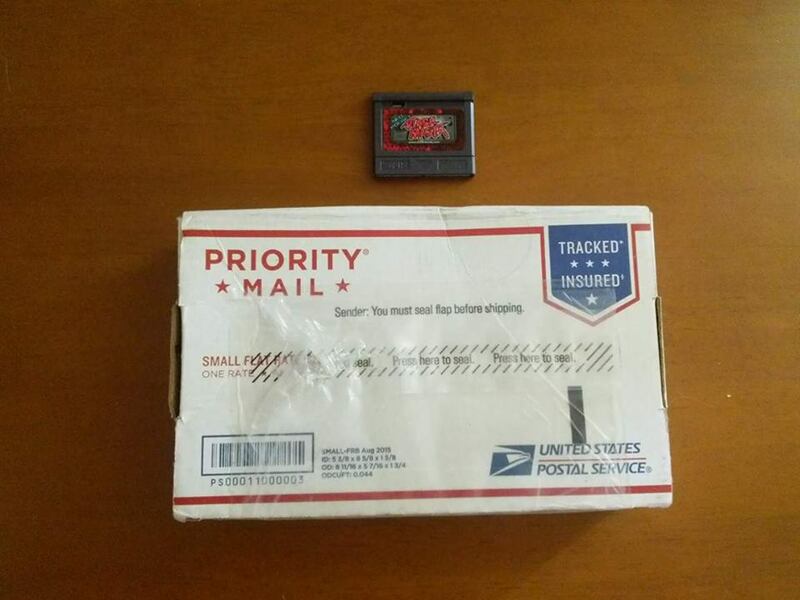 I must admit to being frequently perplexed by US postal prices when shopping on Ebay so it is hard to blame the seller in this instance, but it all adds up to expense that might make people think twice about buying one...especially when the cartridge arrives in such a gigantic and unnecessary cardboard box. Anyway, moving on to the actual product. 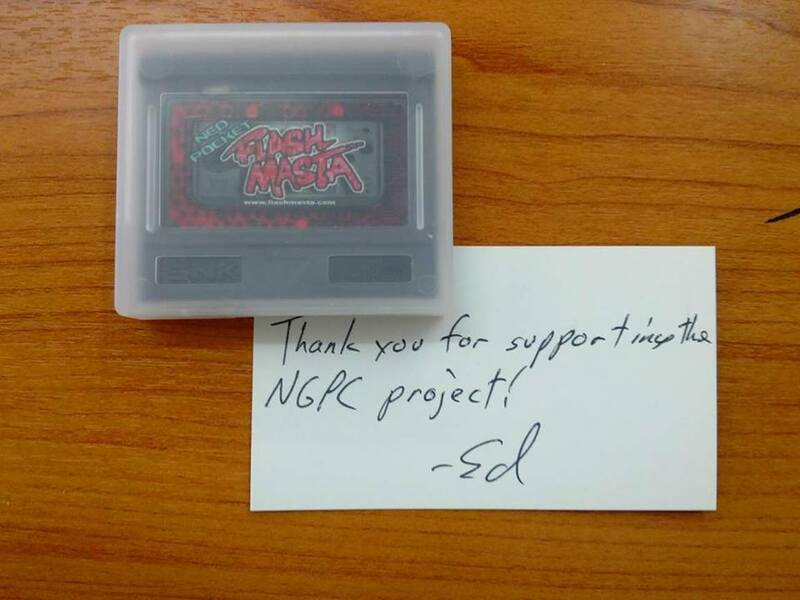 Here's what you get out of the box, the cart, a standard SNK cart holder and a little handwritten note from the developer. The cartridge itself looks almost identical to the previous version except that the little toggle switch that allows you to flip between ROMs is located at the top left rather than the top right. It's when you turn it on its side that the new USB port reveals itself. 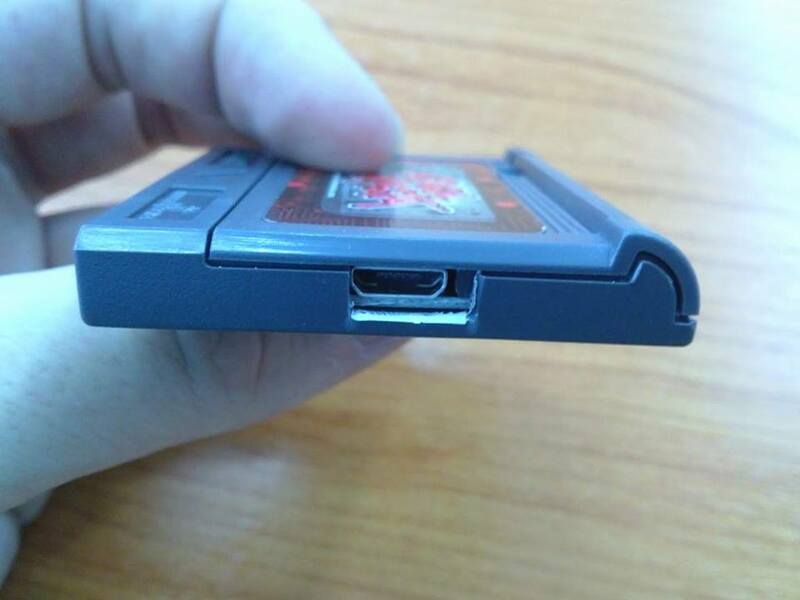 It must be pointed out that, while I had wrongly assumed the cart would be 3d printed, it looks like a sacrificial NGPC game cart was used again here. I have no ethical issue over the death of a Japanese copy of Neo Cherry Master, but I'm aware that it does rankle with some within the retro community so let the buyer beware if you are one of those who oppose this practice. 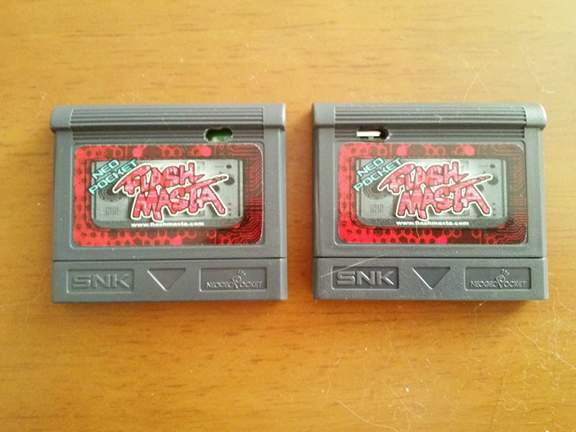 The old Flash Masta cart (left) and the new one (right). The USB port now allows you to plug it directly into a computer. The cartridge itself doesn't come with any instructions so you are left to muddle through the slightly outdated instructions on this page and are prompted to watch a video that (while somewhat helpful) is actually about the Wonderswan variant of the Flash Masta. Basic installation boils down to installing a USB driver on your computer, with the driver installer programme Zadig and then installing and running the Flash Masta software itself. This can take a little bit of tinkering for newbies like us but after ten minutes or so of fiddling around we got the hang of it. A regular USB cable will do the job, although you'll have to supply your own unless you ordered one with the cart at an additional cost. Once detected, you should see something like this. Note the two pre-installed games which is a nice touch. Both of which might be THE reasons to order a Flash Masta given the current cost of obtaining one and the other being a fan translation that can't be legitimately obtained. 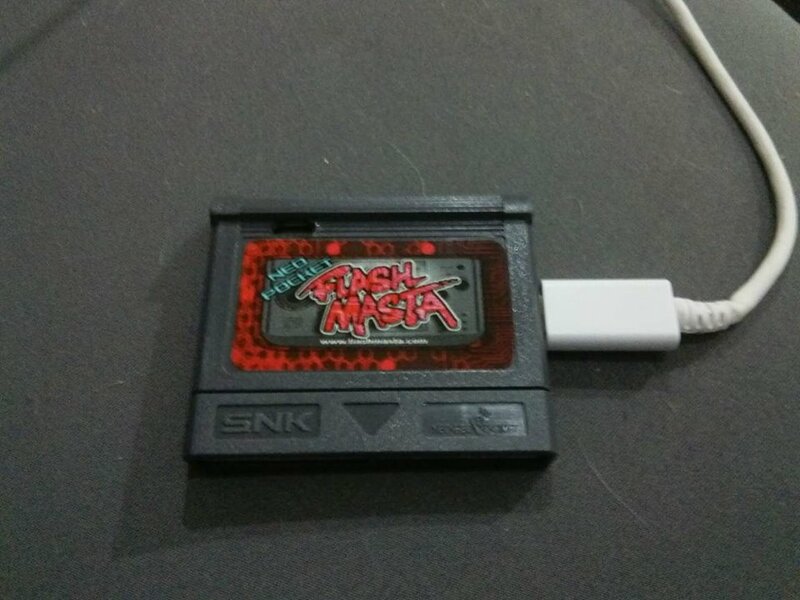 ​The Flash Masta has a maximum cartridge size of 32 MB, big enough to hold the largest officially released games on the system. However, like its earlier variants it has two selectable slots flicked between via the little switch on the front of the cart (you'll need a paperclip or something similar todo this). You could choose to install one 32 Meg game like Metal Slug 2nd Mission or put one smaller game on each slot. it should be noted that games load up EXACTLY as they would on a real cartridge and save in a similar way so there is no messing around with menus or waiting for games to 'load'. The downside, however, and it is a big one, is that at any one time you will be limited to just TWO games on the cart. This is something that really leaves the Flash Masta dragging it's heels in light of recent competition in the flash cart genre, which, again, we'll come to in a moment. Once installed the software has an easy interface that allows you to quickly (ten seconds quick) flash a new game as well as back-up an old one. Finally the days of tracking down that expensive Rockman game only to discover it isn't really very good are over! The actual software itself, couldn't be simpler to use. Our version came pre-installed with Faselei and Cardfighters Clash 2 English version, two games we already had. Thankfully replacing these is as easy as locating the appropriate ROMs (note the system reads .ngp files) and saving them to your desktop, you are then literally only one click away from selecting a slot and Flashing the Game Data to overwrite these and begin playing those hard to find titles currently being hoarded by Ebay scalpers. ​We also had a lot of fun investigating homebrew for the system and, although things seem to have dried up in the past decade, compiling the best of this should make a fun future article. The only thing we discovered was that most homebrew used the file extension .ngc, however once manually renamed to .ngp files, most PD software ran fine on the original hardware. 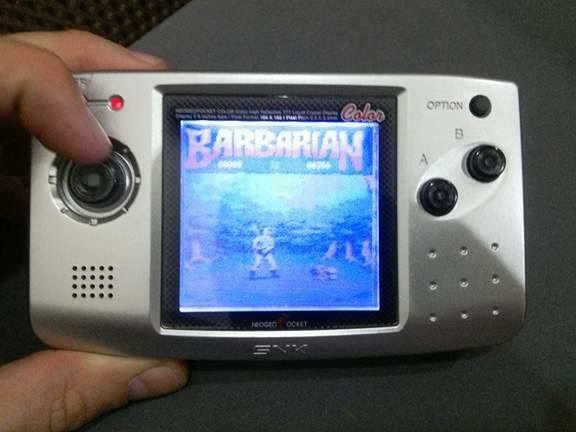 Playing ports of home computer classics Barbarian and Manic Miner on the NGPC was surreal. PD games like Dodger (right) are also worth a whirl. The Flash Masta is great for this...but the two per time cart limit is frustrating. Unfortunately, it was in this desire to quickly explore the system's public domain and homebrew library that frustration set in, due to the very limitations of the Flash Masta itself. Having to constantly unplug the cart, plug in the USB, flash the cart then repeat the process became wearisome. There is more than enough space on the cartridge to hold the entirety of the PD library, yet the interface makes this a tiresome chore. If only there was a NGP flash cartridge that could allow you to fill it up with games and then load them from some sort of internal memory. ​Well, that's just the thing. 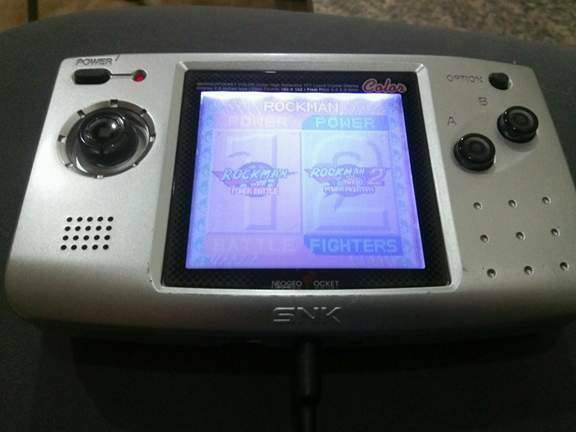 In what seems to have been a parallel development a rival flash cart for the Neo Geo Pocket was also recently released by ﻿﻿RetroHQ﻿﻿. While we'll leave the details for a future review, it appears to eliminate the frustration of the Flash Masta's limited capacity and need to be programmed via a PC, by allowing you to not only use your own Micro SD card to store your collection but also including a front end menu that allows you to select from this and load any games you store on it onto its flash ROM. With a big enough SD card you could easily hold the entire NGPC library, including its public domain homebrew titles, on this cart. The drawbacks of this rival cart appear to be a (significantly) slower flashing time and a 'loading' time when selecting a game to play. 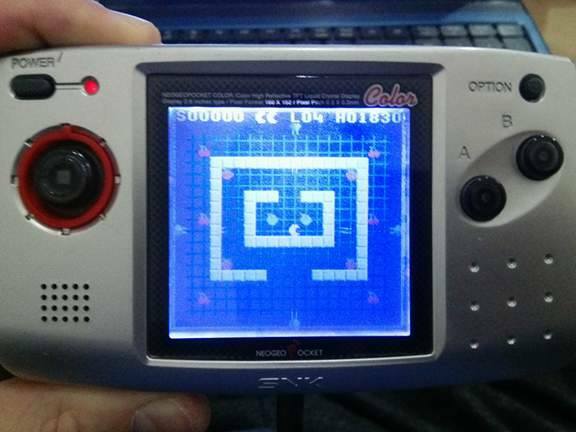 However it does fix the main problems of the Flash Masta allowing you to carry around the library and flash games on the move as well as load maximise the space on the Flash chip by allowing you to fill it entirely and then select which game you want to play. 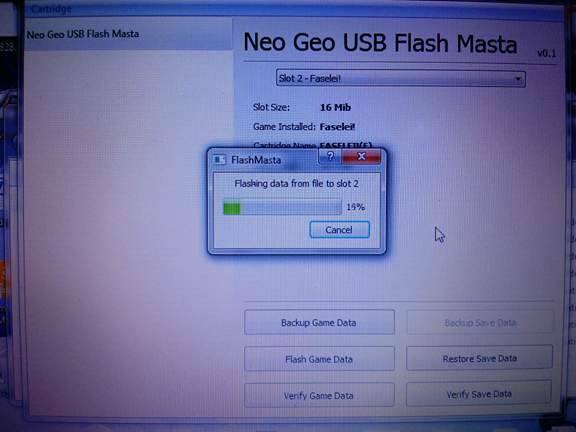 The Flashmasta USB is a solid evolution of the project that many of us have been using for many years now. it adds an ease of use to the original product and modernises it for today's technology, however it's lack of front end menu and limited two slots are beginning to show their age in light of recent flash cart developments and its next step would ideally add this kind of functionality to further improve its user-friendliness. While it loads and looks very much like a real NGPC cart, there is an undeniable feeling of frustration at the familiar two game per time limit and this ultimately means it's something best used for storing a couple of heavy hitters you can never hope to afford on ebay rather than fluidly attempting to explore the homebrew scene or indeed the NGPC's library in general. It's a reliable upgrade to a solid piece of kit but one that might soon find itself rendered obsolete by current developments elsewhere.